My husband and I were happy to discover Breezy Hill Orchard Farm Market, a new local and organic food market housed in a charming historic building in Rhinebeck village, Dutchess County. Elizabeth Ryan of Breezy Hill Orchard in Staatsburg, N.Y., who is an organic-minded Hudson Valley grower, is the owner. The store, which opened in December, is tiny—just 20 feet by 20 feet—but aims high. 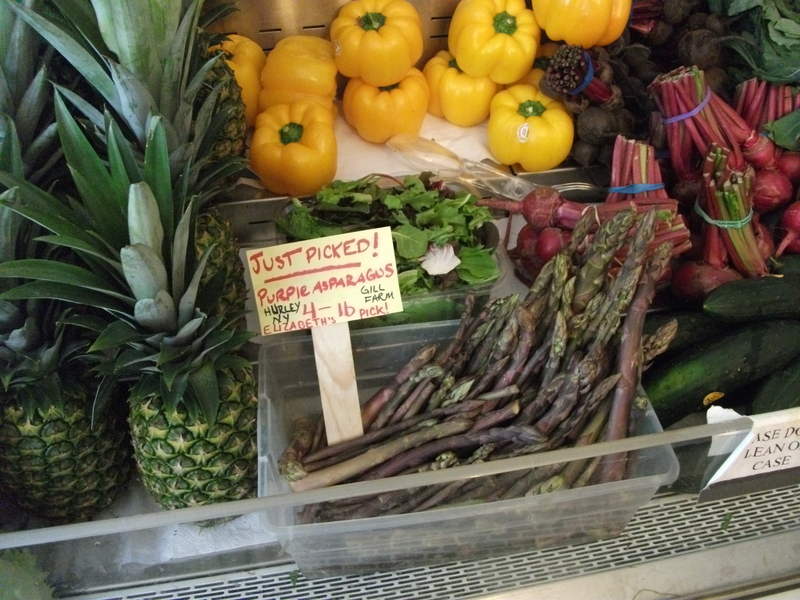 “Almost everything we carry is either locally grown, organic, or both,” says Ryan. Depending on when you go, you might find organic rainbow carrots from California; locally grown (but not organic) purple cauliflower from Hurley, N.Y.; or locally grown and organic Swiss chard. More details about the market in my recent Rural Intelligence article here. 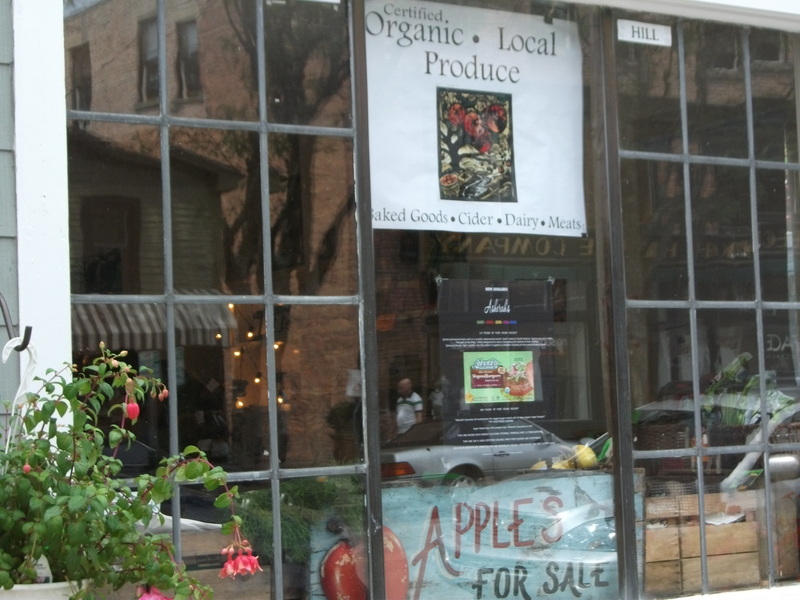 Best of all, if you’re in the village, it’s within easy walking distance…no getting in a car and navigating one-lane traffic to the nearest farmstand or supermarket. As a founding member of New York City Greenmarket farmers’ markets and the Rhinebeck Farmers’ Market, Ryan champions local, organic and sustainable agriculture. In following her passion, Ryan has led Breezy Hill Orchard to its moments in the spotlight. Bobby Flay showed up at Ryan’s farm two years ago for a mayonnaise throwdown. Studio 360 host Kurt Anderson featured Knoll Krest Farm—an egg farm in partnership with Breezy Hill Orchard, best known for its apples and cider—on his radio show. In a joint venture, Breezy Hill for Knoll Krest also produces an artisanal egg pasta that won kudos as a 2008 “Critics’ Pick” in Time Out New York. 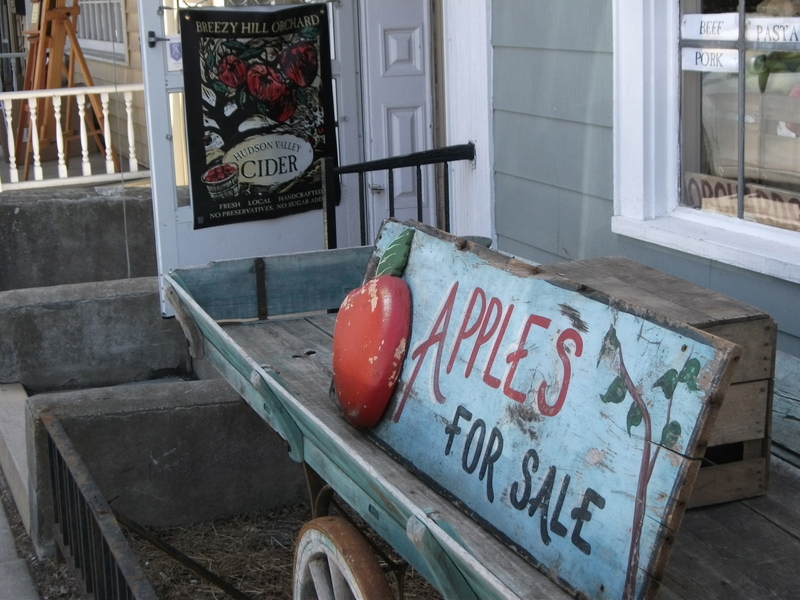 But it’s not all glam foodie press: Breezy Hill Orchard has weathered its share of setbacks. I first met Ryan in 2003 when I interviewed her for a New York Times article. At the time, she was ebullient, enthusiastic and resolutely optimistic about organic growing practices. Later that year, in mid-October, her optimism was tested: Breezy Hill Orchard was decimated in a devastating fire. Over two days, 150 firefighters on 25 fire engines arrived on the scene: it took one million gallons of water to quench the flames. The farm lost all of its buildings, its infrastructure (electricity, running water) and every piece of equipment. Only some of the loss—Ryan estimates $2 million worth of damage—was covered by insurance. “I said good-bye to a lifetime of work,” says Ryan who luckily escaped, unscathed. It was a dangerous fire, too: 1,000 gallons of propane had been hooked up to the building in 500-gallon tanks. Over eight years, Ryan has slowly rebuilt her business, diversifying along the way. Because of the fire, she expanded her farm operation off-premises, to several other locations, including a partnership with neighboring Knoll Krest Farm; Stone Ridge Orchards, a U-Pick operation in Ulster County; and to a Columbia County farm. Despite the setback, she continued to pursue organic farming practices. Breezy Hill Orchard is now in its second year of a three-year process to a becoming “certified organic” orchard—one of the few in the Hudson Valley. The other orchards that she manages are certified in an Eco Fair Trade program, where growers voluntarily reduce their pesticide applications. This entry was posted in Culinary Products, Hudson Valley, Hudson Valley Farms, Local Food and tagged Breezy Hill Orchard, Dutchess, farm market, organic farming, Rhinebeck New York, sustainability. Bookmark the permalink.